This image caught the ascent stage of the "Spider" after the descent stage had dropped. 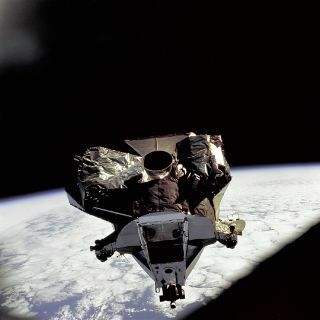 In this historical photo from the U.S. space agency, the Lunar Module "Spider" ascent stage is photographed from the Command/Service Module on March 7, 1969, the fifth day of the Apollo 9 earth-orbital mission. The Lunar Module's descent stage had already been jettisoned.